Newborns are 1.1-1.5m long and adults range up to at least 3.8m. The maximum weight is close to 500kg. They have 2-7 pairs of stout, pointed teeth in the front of the lower jaw, and usually none in the upper jaw. Longevity is at least 40years. Risso’s dolphins are robust blunt-headed animals without distinct beaks. Adults range from dark grey to nearly white, but are typically covered with white scratches, and scars. These are probably mostly caused by the teeth of other Risso’s dolphins, and are unique, therefore they can be used to identify individuals. In general, females tend to be darker than males the same age. The chest has a whitish anchorage patch. The appendages tend to be darker than the rest of the body. Young animals range from dark to light grey and are relatively unmarked. Newborns are more of a brownish-grey colour with a yellow colouration on their foreheads which they lose after a few weeks. The forehead has a more squarish profile than the rounded melon of some other small cetaceans. One of the most distinctive feature is a vertical crease on the front of the melon. The mouthline slopes upward. The flippers are long, pointed, and recurved. 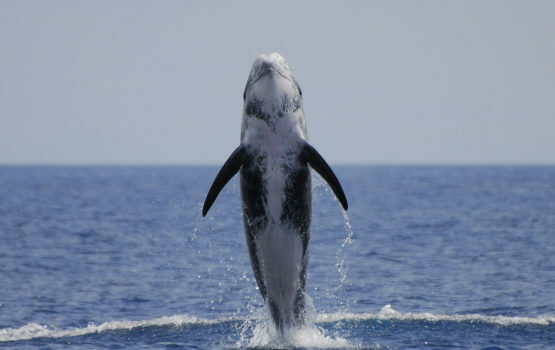 The dorsal fin is very tall and slender. 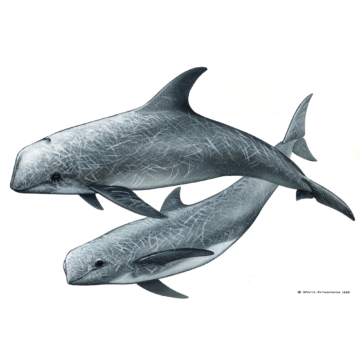 Risso’s dolphins feed on crustaceans and cephalopods, but seem to prefer squid. Squid bites can also be the cause of some of the scars found on the bodies of these animals. In some areas where their feeding patterns have been studied they appear to feed mainly at night, probably following the vertical migrations in the water column done by their prey. They dive up to 30min. 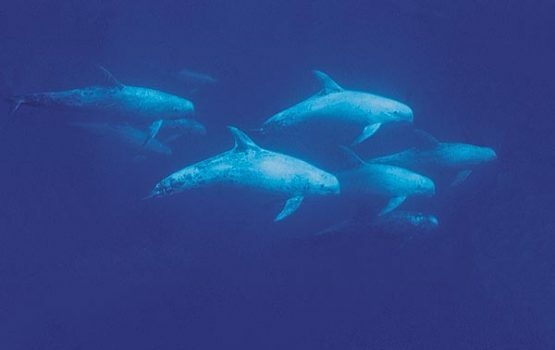 Most groups tend to be small (6-10 individuals), but gatherings of hundreds of Risso’s have been reported. There are still doubts about their social organisation. It appears that young animals remain in their natal group until puberty, adult females gather together, and some adult males form alliances with other adult males. Group composition of subadults can be rather fluid. 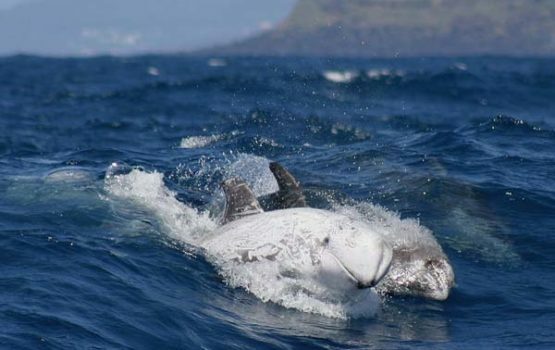 Calving can occur year round, and hybrids between Risso’s and bottlenose dolphins (Tursiops truncatus) have been reported in the wild and in captivity. 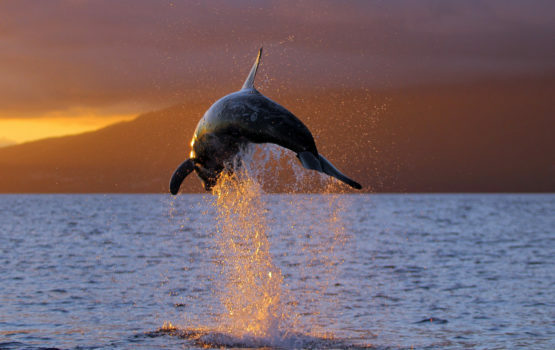 These dolphins are often seen surfacing slowly, although they can be energetic, sometimes breaching, spyhopping, or surfing higher waves. This is a widely distributed species, inhabiting primarily deep waters from the tropics to cool temperate regions in both hemispheres. Risso’s dolphins are generally easy to identify, as they are the only medium-sized, blunt-headed dolphin that are typically light in colour. However, from a distance they could be confused with bottlenose dolphins. 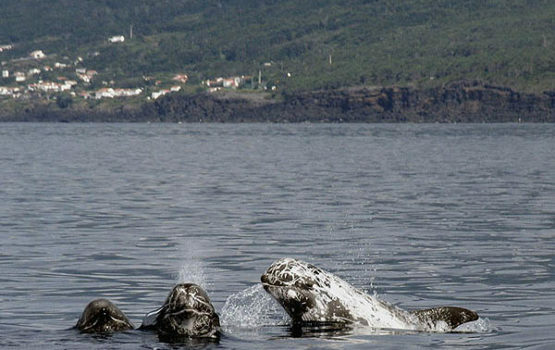 Risso’s dolphins are one of the most frequently sighted species for Espaço Talassa because there is a resident population inhabiting the south coast of Pico, where they are found really close to shore. The number of sightings have been increasing gradually over the seasons, and there seems to be a similar pattern when we look at the sightings per year. This means that we see them more often at the end of the season (late summer and autumn) than at the beginning (spring), but on average they are present on 60% of our trips.